Enjoy your spa or hut tub year round! Make sure you know how to operate it properly in winter months. Winter is one of the most wonderful times to have a hot tub or spa. When cold weather gets everybody else down and forces them to put their swimsuits away for the season, you have the luxury of slipping into yours and submerging yourself into a bubbling, warm tub of water that will make you forget it’s snowing outside. Here are some tips to make sure your hot tub or spa experience is as enjoyable as possible in the winter months. 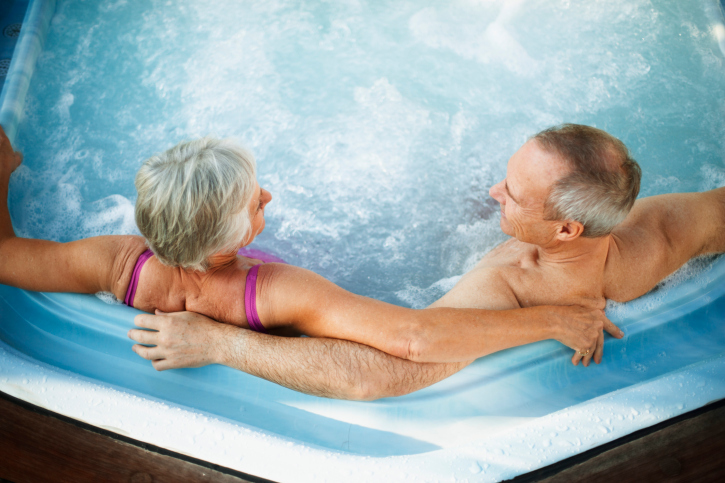 You’ll need to keep your hot tub clean and properly treated in order to enjoy it. Keep your shock, balance and chlorine handy so you don’t have to go hunting for it if you realize conditions aren’t quite up-to-par. As you’re preparing your hot tub for the winter months, be sure to brush up on the operating manual (as models can differ). If there are any specific instructions on winter operation, such as a “freeze protection” setting – learn when and how to operate it. If you live in a cold climate, you should utilize the freeze protection feature for as long as your hot tub is filled. If your hot tub doesn’t have this feature, make sure you understand how to operate the timer and activate a heating cycle. In the Mid-Atlantic region, running a heating cycle for fifteen minutes of every hour is effective. You should always maintain the water level in your spa, ensuring that it is above the skimmer line and jets. This will aid in continued filtration and operational jets. If you allow the water to get too low, the pumps and heaters will stop running and freeze, resulting in severe damage. You should also consistently check the temperature of your water. Colder temperatures could signify that your heaters are malfunctioning. Whenever your hot tub is not in use, make sure it is securely covered. Are You Ready for a Home Spa? Sunrise Premiere Pool Builders LLC not only conducts Maryland spa, hot tub, and pool installations and renovations but also provides pool services, Chemicals, salt generating systems, and more. If you have any questions about your pool contact the professionals at Sunrise Premiere Pool Builders LLC. by calling 410-349-3852 or clicking here today! Check us out on Facebook, Twitter, Google+, Pinterest, and LinkedIn to keep up our latest spas, custom pools, maintenance accessories and stay knowledgeable of the latest trends in the custom pool and spa industry. We are here to help you live in luxury at a price you can afford. This entry was posted on Monday, January 11th, 2016 at 1:37 am. Both comments and pings are currently closed.